"Great Danes Personal Checks" product is already in your cart. Great Danes checks show four rotating pictures of different Great Danes posing for the camera. These giant dogs were used as boarhounds in Germany in the 16th century. Today they are valued as devoted family pets and are also raised for show competitions. One of the most famous Great Danes of our time is the cartoon character, Scooby Doo. Yes, Scooby is the most favored and famous of the Great Danes. Scooby got his name while Fred Silverman was listening to 'Old Blue Eyes' by Frank Sinatra. The song has a repeating phrase....you guessed it....'Scooby-dooby-doo'. 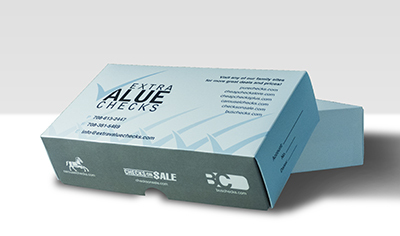 Great Danes Personal Checks are available in single and duplicate check format. Matching address labels and a coordinating checkbook cover are also available.